Sorry, unfortunately, StationRipper is no longer in our catalog because of its illegal activity. Want to Record Internet Radio? Get thousands of sounds every few hours? Record your favorite Shoutcast Radio or TV show? Record Last.fm, Pandora.com, AOL Radio.com, Slacker.com, iTunes radio, or Podcasts? Then download the latest version of StationRipper now! 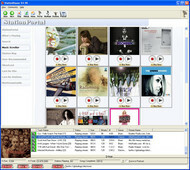 StationRipper allows you to Record Internet Radio Stations and broadcasts. Users on broadband connections regularly report 3,000-6,000 new songs can be downloaded every 24 hours with the registered version. Record Shoutcast Radio and Video, Last.fm, Pandora.com, AOL Radio.com, Slacker.com, and Podcasts. Choose from over 12,000 radio stations, tens of thousands of Podcasts, and almost unlimited combinations of Last.fm stations. * Record Shoutcast Audio and Video streams, iTunes Radio, Podcasts, and Last.fm. * Record Pandora.com, AOL Radio.com, Slacker.com. * Records up to 600 streams at one time. * Buy the music you are recording. * Auto-download Album art. * Use with iTunes - auto-generate iTunes playlists of songs recorded, and auto-sync to your iPod. * Use with Media Monkey - auto-generate MediaMonkey playlists of songs recorded. * Keeps track of the songs you've already recorded, only keeping the songs you don't already have. * Lets you easily find stations to record, via the StationRipper Portal, Shoutcast, or other web sites. Or you can drag and drop from iTunes radio to start recording. * Keeps a list of the music and stations you've recorded, allowing easy playback and re-recording of stations. * Listen to any station being recorded with a single mouse click. * Ignore songs under a certain size. Capture streaming Video and Audio.